The regatta started with an about 88 NM long archipelago race, rounding the beautiful island of Korppoo and stretching out towards Utö. The regatta continued with only two Windward/ Leeward races because of the poor wind conditions. 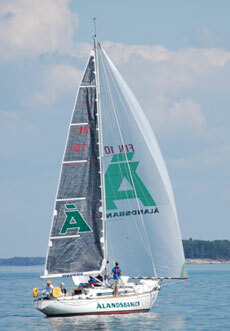 A minimun of three races are required to fulfill the requirements for the National Championships. Full results and other info is on www.turunpursiseura.fi/ow2006. Pictures in our gallery. Our goal was as before: Win them and win them All! But this time, we were not succesful with a fourth place. Well, now that the first race is finished we must admit that we will be hard pressed to succeed in our goal to win them all. The long archipelago race started in very variable conditions and we took the lead right away. This continued until we where bypassed by the first boat about halfway through the course, when the Swan 45 (IMS 1) Blue Nights overtook us after Bokulla sten. At this time we think we might have been in the lead. At least we managed to pull away from the fleet considerably and found us at in the end overtaken by only the big IMS1 class boats - Blue Nights, Siragusawa, Luna, Birgitta and Aquavit. Results here. The sailing through the archipelago at the end of the course proved then to be quite tricky and even though we managed to keep the Estonian Lady Bird behind us up to the finish line, it was no good as the sea breeze strengthened towards the late afternoon and all the smaller boats in our class (and the other classes) flew through the course and finished with a considerable margin. Winner in our class was the small Finn Express Charlotta, while her sisterboat was second and an IW31 third. Charlotta did the last 20 miles from Smörgrund about 1 h 45 minutes faster than we. We took a whopping 7th place, so the goal to take the Nationals (only race we haven't yet won in our area) was put back to maybe another year... As for now, the AP is up and we are waiting for the wind. The second racing day started off in rather tricky conditions, with very light and variable winds. In the first W/L-race of the day we managed to position ourselves quite nicely time to time, but as the wind died just at the finish line, we could only see us beaten by a good margin by Xanthe (ex. Carabilla II), Charlotta, Esteri and Toi. Final position (after two corrections) was a miserable 8:th. A rather terrible race concerning the wind, as it almost never got to be over 6 kn (true). Check track and wind trace in the gallery. The second race was sent away some time after the first, but as the wind shifted drastically just as we rounded the windward mark, the race was cancelled. This was definitely a good thing, because having almost 40 big offshore racers going back and forth on the same line in speeds exceeding 6-7 kn, a crash would have been inevitable. Now the wind strenghtened and the third race for the day was a real success, as we took both the line honors and the race itself and found ourselves (quite remarkably) in second (or third?!) place over all after day 2. The wind was both good and steady and eventhough the race was over in 24 minutes it felt like REAL Racing. You could actually feel how the old Lady flew away on the course! Check track and wind trace in the gallery. Results here. The third racing day was a race at the docks (no wind out at sea), and as our capabilities in this particular type of racing are not that refined, we found ourselves first in 3rd place overalll and finally in 4th... So no National titel this year either. We shall have to do it next year!